Science and math are the design inspiration behind a spectacular garden found in southwest Scotland. 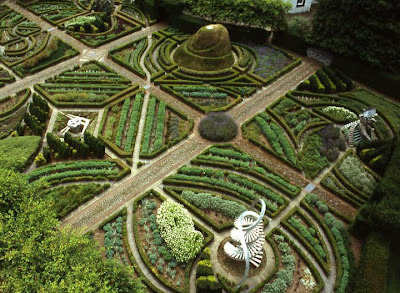 The Garden of Cosmic Speculation at Portrack House near Dumfries is just one of the amazing landscapes designed by American architect, critic, and theorist Charles Jencks. The DNA Garden (pictured above, Fractal Terrace, and Cascading Universe pond are just a few of the features that await you. But don't put your garden clogs on just yet. The garden is only open once a year so make sure to check in on the Scottish Garden Schemes website for details on annual openings.